A spectacular and unique mountain style home, with breathtaking views of the Catedral ski resort, Habsburgo peak and Arelauquen Country Club. The house backs onto the golf course along the 13th fairway. The 330 sq metre house sleeps up to 10 people and has a separate maid’s quarters. It has a distinctive mountain lodge “feel” with cypress wood beams. There is a stunning double height lounge with large fireplace. The house has three bedrooms upstairs including a master suite with Jacuzzi bath. There is a mezzanine floor area with satellite TV, DVD and surround sound for entertainment. Downstairs there are two further bedrooms which can also be used separately or together as a suite, with it’s own lounge and TV/DVD facilities. The kitchen is fully equipped as would be expected, given the luxurious nature of the house. Maid and cooking services can be provided if required, by separate agreement at an additional charge. 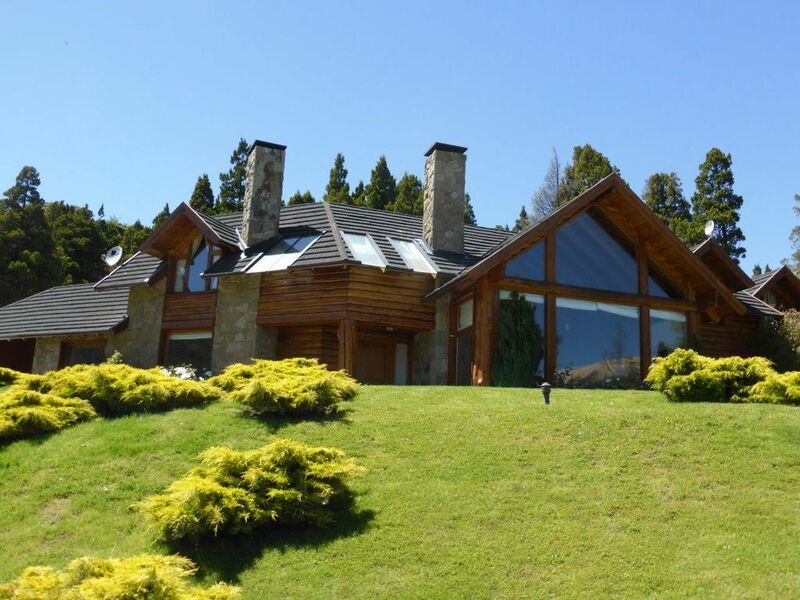 The house is located in the gated and exclusive Arelauquen Golf and Country Club, near Bariloche. Arelauquen is a year round community located 10-15 minutes from the best ski resort in South America with it’s 120 km of groomed pistes. It is also 15 minutes from downtown Bariloche and 20 minutes from the International airport. Guests will have access, at preferential rates, to the huge range of leisure activities in Arelauquen. These include golf – the course was designed by Vincente “Chino” Fernadez, several watersports, polo and horse riding with trekking into the stunning countryside, mountain biking, squash, tennis and swimming/sauna/spa facilities in the 1,300 sq metre “Clubhouse” which also includes a well equipped gymnasium and an indoor/outdoor 25 metre pool. Bariloche is in the heart of the Argentine Lake District, about 2 hours flight south west from Buenos Aries. The international airport is well served by carriers with routes to Santiago (Chile), Calafate and Buenos Aries. It is the premier holiday destination in the country in both winter and summer with a well deserved reputation as the leisure capital of Argentina. The local people are friendly and welcoming and the scenery is simply unforgettable. Great home! We had very good weather and the home was a good home base. The local contact was very responsive which made our experience fun. We had good local insight for hiking, fishing and restaurants! I had decided not to write a review ( my Dad always said "if you can't say something nice about someone don't say anything"), however as I thought about it I realized that my experience might be helpful to others. Our group was four couples who have traveled together and have rented houses, condos, boats, etc. in many countries for years. First of all, the local contacts were excellent and very helpful. Polite, available and willing to help. Unfortunately we needed help. Some of the windows did not open making several bedrooms very hot at times. The locks on several of the doors did not work and it took several days to repair/replace. One morning we lost water pressure in the middle of several showers. Another day the toilet back up. It was difficult to use the washer/dryer because it was in the same room as the water heater which was leaking. The on/off switch on the dishwasher was broken and had to be repaired. These little things added up but they were generally "little things" you could expect in a rented house. The main problem is that it did not really have four bedrooms and four baths as advertised. The house would have been fine for three couples. The forth bedroom had a very uncomfortable small single bed (couch) with a smaller, lower trundle bed which pulled out from under the couch-bed. The "forth" bathroom was actually in the maids quarters which was separated from the house and certainly not meant for guests. The cleaning materials, washer/dryer and water heaters ( one of which was leaking) were also in the maid quarters. Having said all of this we had a very good time in the area and I am sure the problems with the house will be corrected. For adults think of it as a three bedroom-three bath house. For a family with kids you could probably use one of the sitting rooms as a bedroom. If the small problems were fixed a large family would love this house. We had the most wonderful time at Casa Paine. The place is cozy and very comfortable. Moira, the house manager, is adorable and exceeds in making the guests feel welcomed. A group of six of us stayed at this house for about a week. The house and neighborhood were fantastic. The security at the gate was top notch (I don't worry too much about security in Argentina but it is good in a tourist area). The views were great, in the morning we loved being able to see the lifts we were going to ride that day. It is very convenient to Cerro Catredal, it only took us about 15 minutes to get to the mountain each morning. Moira welcomed us, showed is the house and was available if we needed anything. We didn't need anything from her and she arrived promptly when it was time for us to head to the airport. It was a great trip and a great value overall. Would definitely stay here again. Lovely house and excellent hospitality! This is the 5th time we choose Arelauquen for summer holidays with the family and this time the stay was at Casa Paine. The house is lovely and if I have to point out one "special" from the house is the wonderful views of the Cerro Catedral (each evening could not escape from that!). Arrangements and with the owner Josh was outstanding. Last but not least, the day to day hospitality during our stay was perfect in the hands of Moyra (some minor things with machines and heating that she took prompt care and action). All in all, looking back at Casa Paine, Josh and Moyra, no doubt to recommend to friends and family! Looking forward to visit the house again in the future. Stunning property and excellent location! Met and exceded expectations! The home was very clean and well maintained. The communication between the owner and manager was above and beyond wonderful. We had rented our own car and did a sailing trip on the lake one day, downtown Bariloche is only a 15 minute drive and we enjoyed walking through shops and enjoyed restaurants in town. There are grocery stores just 5 minutes from the house so we enjoyed many meals at the house including the use of the parilla!!!! Highly recommend! I hope I will have the opportunity to stay again someday! Until confirmed, rates are subject to change without notice. Advance payments of 25% deposit are required. The balance will be payable 6 weeks before the stay. Security and damage deposits may be required. There is an additional charge of US$200 per stay, payable in Pesos to the local property agent for cleaning, laundry, meet/greet, check in/out services etc.